Visit Sancheong town to find somewhere to top up the phone. We wake strangely early, and decide to go on a morning stroll. It’s just before sunrise, and for the second day in a row I’m armed with my camera at dawn. It’s not as spectacular as sunrise from Cheonwangbong, but playing around with the zoom results in a few shots which would provide the basis for one of those kitsch motivational posters. As we turn back to the chalet, we hear a vehicle in the distance. As it comes into sight, Kyung-sook immediately recognises it as the mayor’s car. She explains that every morning the mayor comes on a tour of inspection to see how the project is progressing. He has done this every day during the construction period, and even now when the Expo has finally opened he is still making sure, before the day starts and the visitors arrive, that there are no snags. The car pulls up beside us. The driver is the head of the County forest department. This morning they have been inspecting the recreation forest. I wonder what has been added to the to-do list this morning. It seems that we have some impromptu guests for breakfast. We return to the chalet and swing into action: Kyung-sook peeling the fruit and mopping the benches of dew and moisture, and I in charge of making the filter coffee. We have just enough paper cups to go around. 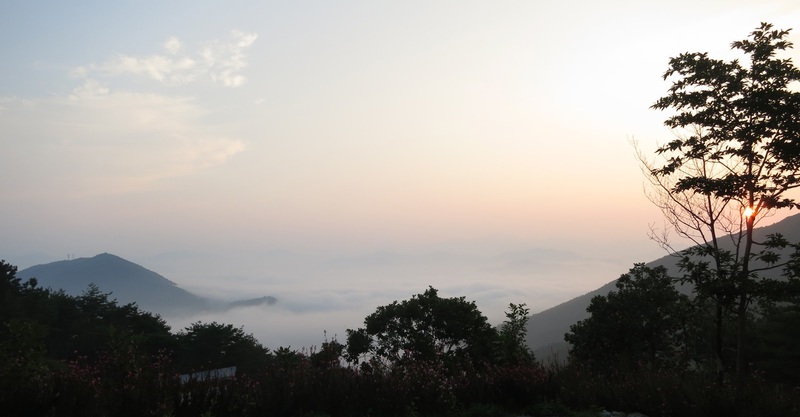 The mayor talks to Kyung-sook about the recreation forest while I look out across the valley, mulling over how to translate “enterpriser cooperative” into everyday English. But we cannot linger long. We have a 10am appointment at the institute. En route, we pick up the English language guide to the Expo – a detailed map with descriptions of the different attractions. This is enough for me to plan my visit later in the Expo when I return from our away trip into Jeolla Province. It’s more than a pleasure to look in at the main information office just inside the main entrance: the immaculately dressed staff in colour-coordinated costumes are most welcoming. The overall colour scheme is of blue and orange, with a touch of green. 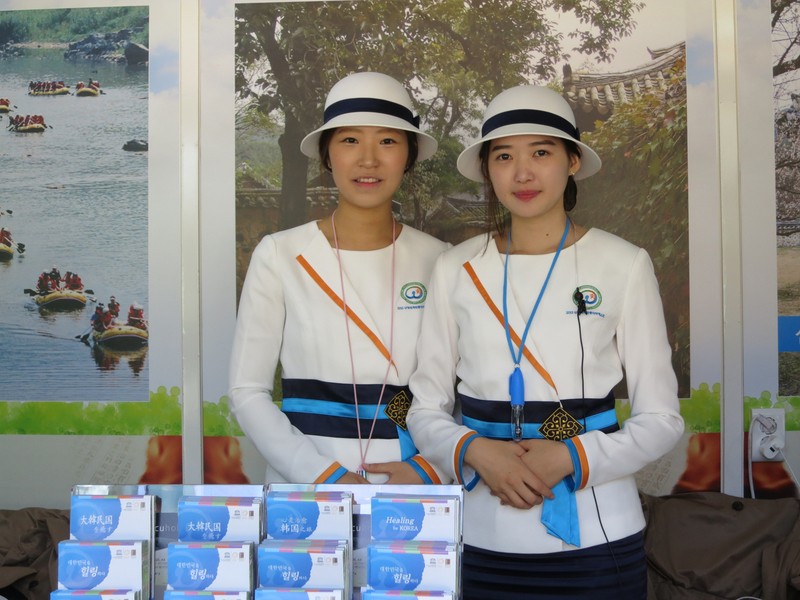 Similar uniforms, with the same charming straw hats, are worn by the staff that greet you at the ticket barriers and by all the other female guides and attendants. Male guides like Mr Min share the colour scheme, their uniform being an orange shirt and blue blazer. Based on the philosophy of Korean Traditional Medicine and the idea of the three elements of heaven, earth and man (● ㅡ ㅣ), it has a unique human form that visually represents love of mankind and the globalization of Korean Traditional Medicine. The figure starts from the character of man (人) and grows into a big circle, which also signifies the circulation and convergence of the universe and all things in it. The blue colour used for the human figure symbolizes a future-oriented vision and the universe, while also signifying the globalization of Korean Traditional Medicine. The colour used in the herbal leaf and the inside stands for the philosophy of traditional medicine and humanitarianism. No big event is complete without a mascot or two. 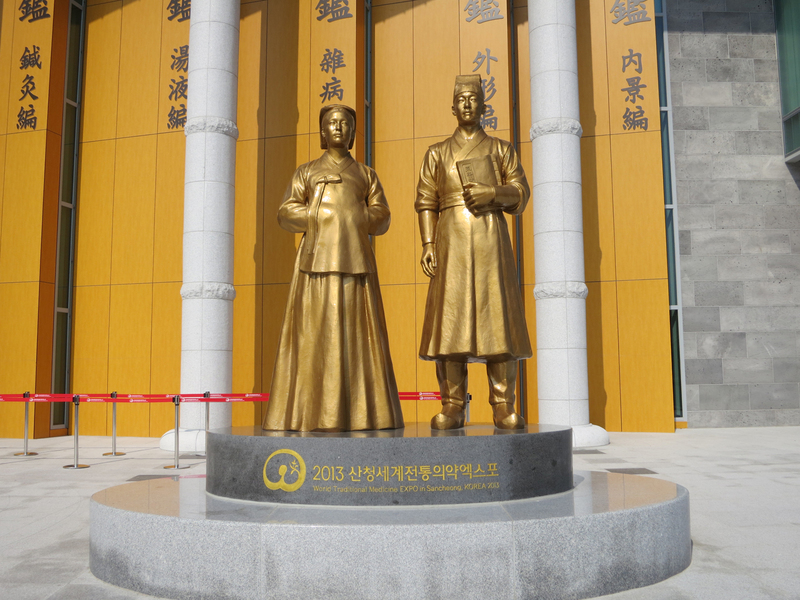 Thankfully, traditional medicine has two well-known historical spokespeople who make an ideal couple: Heo Jun and Dae Jang Geum. These two prominent characters are transformed into the cartoon mascots Juni and Geumi who appear at the centre of the logo, while a more formal statue of these two important characters is erected just outside the central building of the Expo campus. We get back into the car to drive to the Institute, and I examine the Expo guide, planning my visit for later that week. I refold it to fit it into my pocket and examine the cover. The International Traditional Medicine Fair and Festival. I looked at it again. Yes, it certainly said “Fair and Festival”. What on earth had happened to “Expo”? It emerges that there has been a minor technicality: there is apparently an international body which controls the use of the word “Expo”. 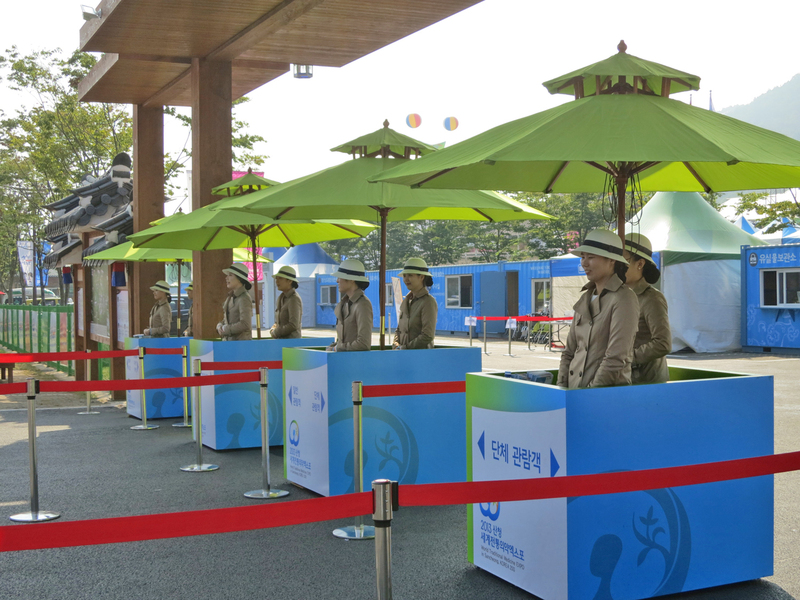 And because Korea seems to have so many of them (for example, the Suncheon Garden Expo 2013), this celebration had to be called a “Fair and Festival” rather than an “Expo”. The blow came too late to change some of the more permanent signage (for example, underneath the statue of Juni and Geumi), but the guide maps to the event were re-printed to drop the reference to the word “Expo”.